Lionfish are a very aggressive invasive species native to the Indo-Pacific and Red Sea. But they have taken a foothold in the Atlantic, and now can be found year-round from North Carolina to South America, including the Gulf of Mexico. They can be found in almost all estuarine and marine habitat types and have been found in waters up to 1,000 feet deep. They can flourish in a wide range of environments, reproduce at an incredible rate, have a very fast growth rate, a voracious apatite, and can eat a large range of food types. This dangerous combination of characteristics combined with a lack of natural predators has allowed lionfish to heavily populate a wide area and threaten the existence of many native species. 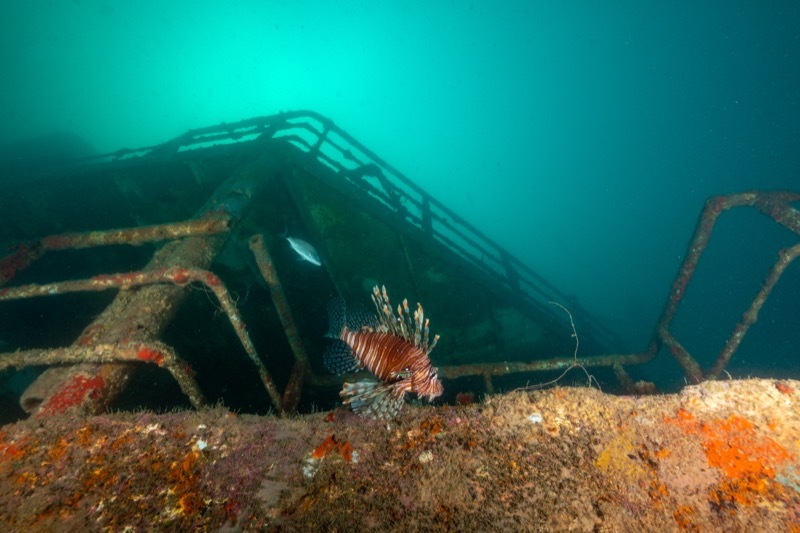 In many cases the native inhabitants are disappearing as lionfish take over. When the female’s eggs are ripe they appear as silvery white areas on their body. When ready for spawning the males becomes darker with less-visible stripes, and may congregate with several females. The male will begin to swim circles around a female, and she will begin to follow him as he swims, usually up toward the surface and back down several times. As she follows him the female will shake or tremble her pectoral fins and release up to 15,000 eggs as the male releases sperm. Many thousands of eggs can be fertilized in one spawning, and one female can spawn once every four days, year-round. The larvae hatch about 2 days later and drift for a month or more, allowing them to become widely dispersed by currents while reaching their final destination. Lionfish feed on almost any species of small fish, shrimp, crabs or other crustaceans, and one lionfish can consume very large quantities of prey. They will stalk their prey using their large fins to corner them and then swallow them whole. Because they eat so many juvenile fish before they have had an opportunity to reproduce they are decimating many fish populations. Although the meat is a mild white delicious and quickly becomes a favorite of those who try it, the only effective way to remove them currently is through diver harvesting. Numerous groups now sponsor lionfish derbies and tournaments to try to remove as many as possible. The state of Florida has removed most restrictions on harvesting lionfish, and no license is needed if using a pole spear, a Hawaiian Sling, a handheld net or any spearing device that is specifically designed and marketed exclusively for lionfish. Permits are also issued to allow the taking of lionfish even in the no-take zones of the Florida Keys National Marine Sanctuary.